There’s another consignment sale coming up in a couple weeks and of course I signed up to consign. 🙂 I’ve been trying to once again hit some garage sales in the weeks beforehand and I will eventually post pictures of all my scores before the sale as well as another re-cap after. But in the meantime, I just have to brag about today’s score! Once of the great things about living and garage sale-ing in the Los Angeles area is that every once in awhile you stumble a wardrobe sale filled with still somewhat fashionable but extremely cheap clothing leftover from a recent production! I know that some people are probably balking at the idea of me wearing a stranger’s used clothing, and at one point in my life I probably would have also balked at the idea. However, in recent years, I’ve come to really appreciate the price tag involved with “new-to-me” clothing and don’t mind it so much. And again, I’m lucky to live in a place where you can stumble upon remotely fashionable and cute used clothes at garage sales if you know where to look. This morning I stumbled upon an awesome garage sale and scored the following new pieces to my wardrobe. A few of the items were brand new with tags; several of the others could have been brand new or only worn once. And I got all for the amazing price of $19! 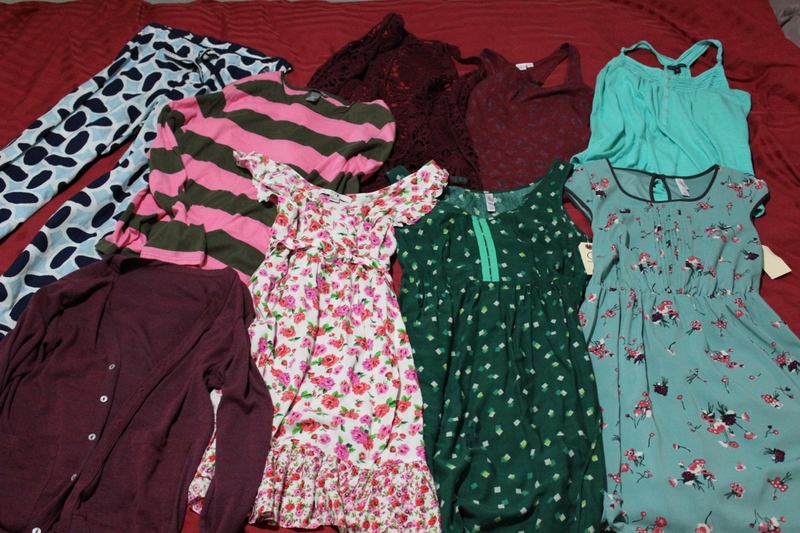 That’s 3 dresses, 2 sleeveless shirts, 1 lacy vest, 1 long sleeved shirt, 1 cardigan, and 1 pair of pj pants. You got some great deals! I like shopping at yard sales etc first ! You’ve got this garage sale shopping down to a tee. I wish I could do more garage sale shopping. I am in the market for a good sized workdesk for our own office. Just not sure if I should go for a pre-fab desk or something that’s built in with our houses furniture store (Christi).